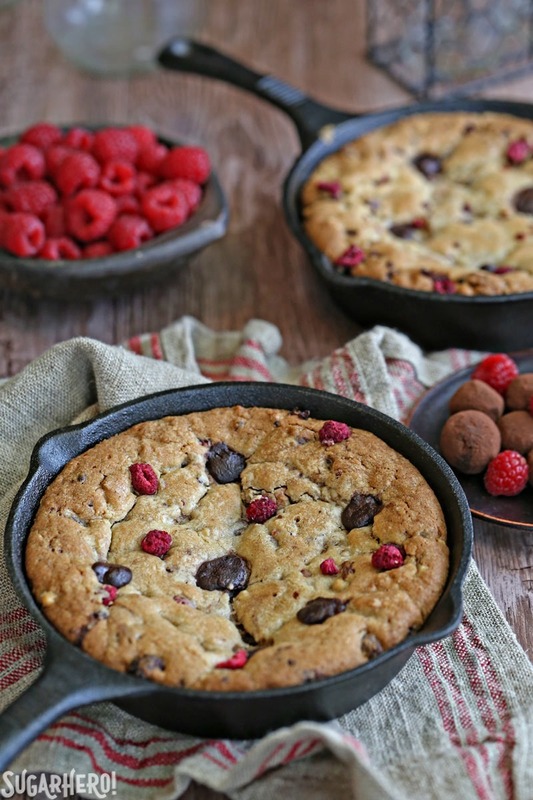 Raspberry Truffle Skillet Cookies are an upgraded version of chocolate chip cookies! Instead of chocolate chips, they’re packed with gooey chocolate truffles, toasted nuts, and sweet-tart freeze-dried raspberries. 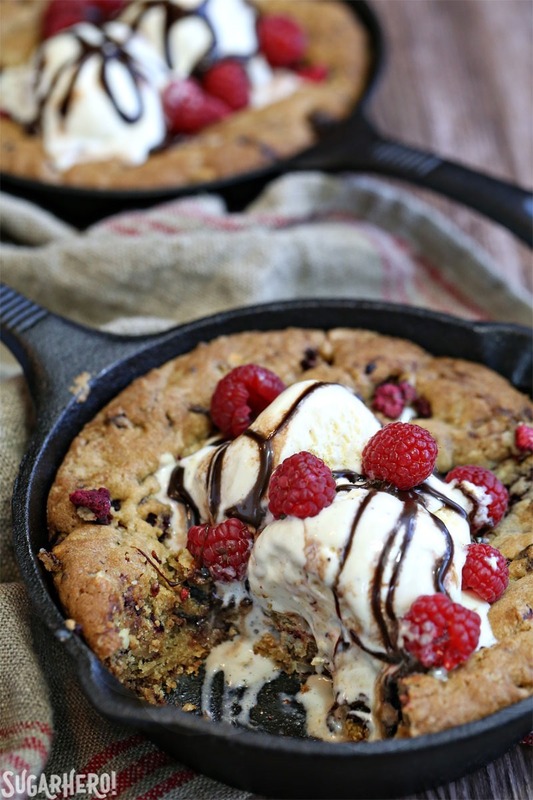 Serve them in a skillet with a scoop of ice cream on top for maximum indulgence! February seems like the perfect month to go chocolate crazy. As long as we’re collectively suffering through gaudy Valentine’s Day displays of stuffed animals and heart-shaped décor and overpriced roses, we might as well put those ubiquitous boxes of truffles to good use, right? Let’s vow, right here and right now, to stuff truffles into as many things as we can this month. A few years ago I put them on top of an ultra-chocolatey cake, and today I’m cramming them into cookie dough with lots of raspberries and nuts. I think this needs to be a February tradition. Let’s truffle all the things! When you think about it, truffles are basically giant chocolate chips. I mean, they’re made with cream, sure, so they have a softer texture than straight chocolate, but what’s to stop us from treating them like mega chocolate chips and stirring them into cookie dough? Nothing. We’re adults and we do what we want. And what we want, oftentimes, is big puddles of gooey chocolate encased in warm, buttery, brown sugary dough. So this recipe starts with a pretty basic chocolate chip cookie dough. It has lots of brown sugar, lots of vanilla, and an extra egg yolk for tenderness. 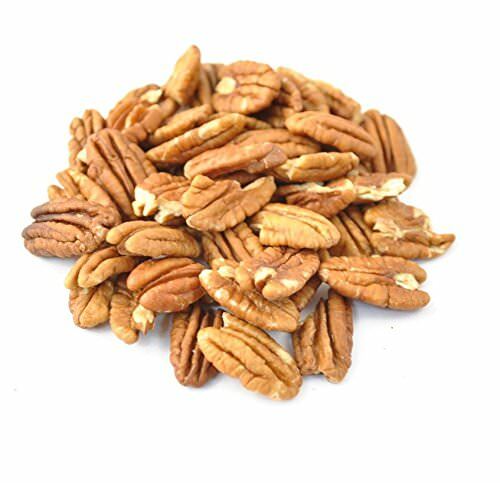 I added toasted pecans for crunch (although you could use walnuts or hazelnuts), freeze-dried raspberries for tang, and then a bunch of chocolate truffles in lieu of the standard chips or chunks. I used homemade truffles that were not dipped in chocolate on the outside, so they were a bit more fragile than some store-bought varieties. I made sure they were well-chilled before stirring them in, and they held up fine, so if you’re going the homemade route just give yourself some time to chill the truffles appropriately. 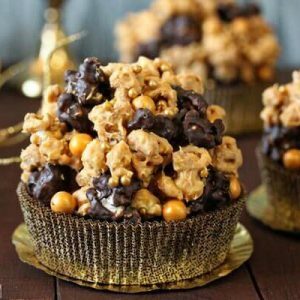 I liked using homemade truffles because it fit in with the rustic spirit of skillet cookies, but I think that using store-bought has some advantages too. For one, the time factor—just buy and go! For another, it could be fun to use a mixed box of truffle flavors. 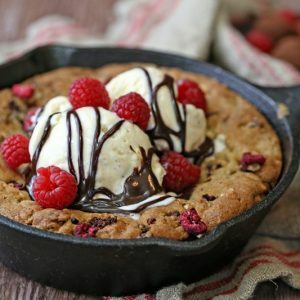 As long as they’re not too aggressively weird, having different flavors of truffles in the same skillet cookie could be really delicious. A bite strawberry-chocolate here, a nibble of salted caramel-chocolate there…each bite a tasty guessing game! 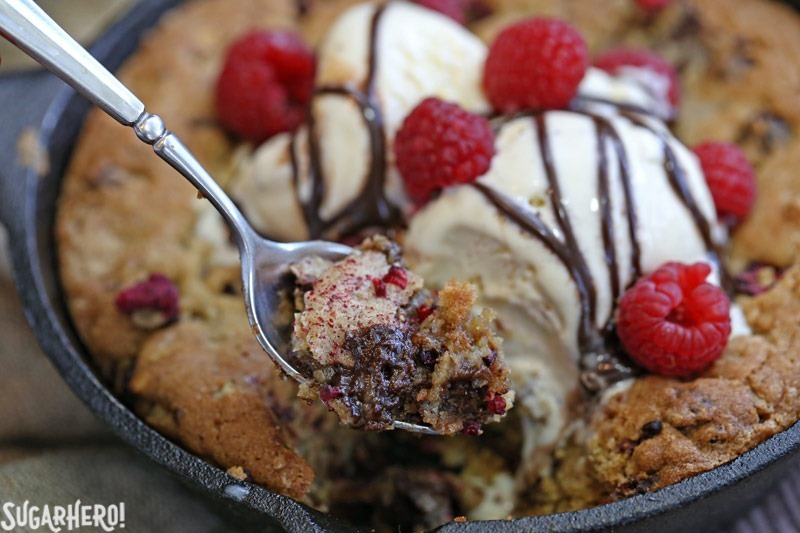 It wouldn’t be a proper skillet cookie if it wasn’t topped with big scoops of melting ice cream. So these cookies got the full treatment: vanilla bean ice cream, drizzles of warm fudge sauce, and a few fresh berries thrown on top. For maximum meltage, be sure to serve them when they’re still warm from the oven. And don’t bother with knifes and forks—just give everyone a spoon and tell them to dig in! 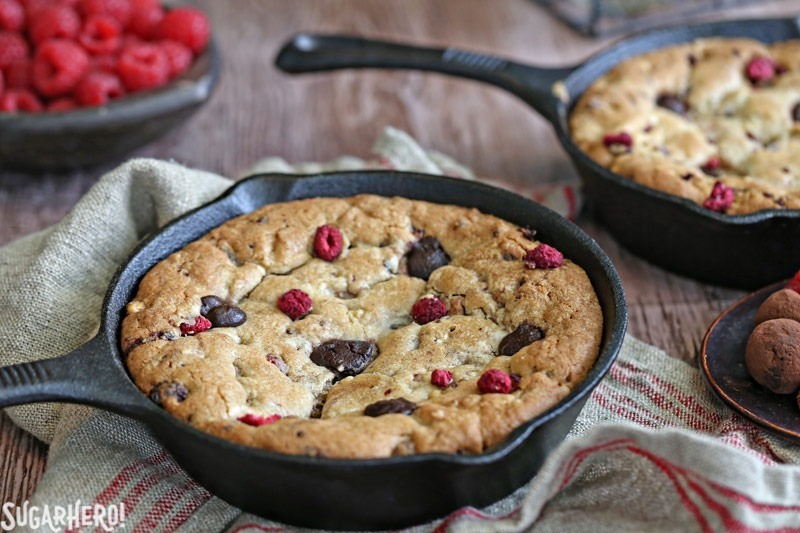 I baked my cookie dough in several medium-sized (about 6”) cast iron skillets, for no reason other than I like the way they look. I’ve also included instructions for making them in a large skillet, mini 4” skillets, or (yawn) scooping them like cookies. There’s really no wrong way to eat these. Enjoy! 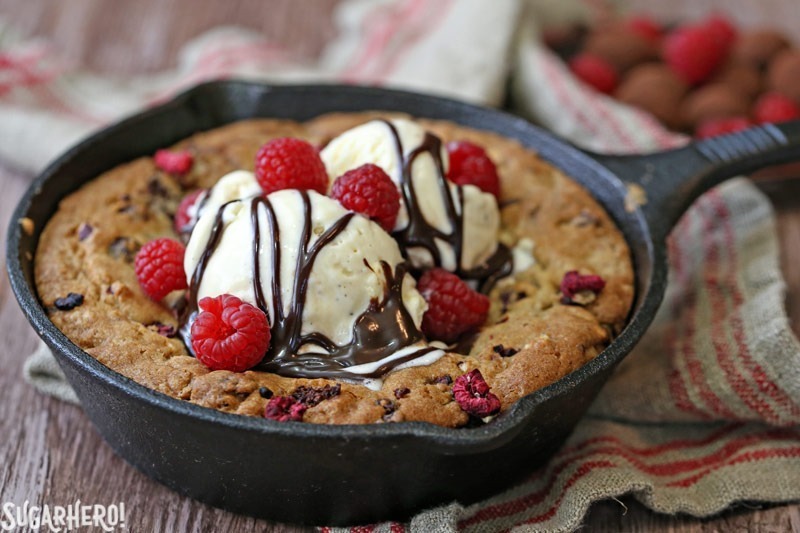 Raspberry Truffle Skillet Cookies are an upgraded version of chocolate chip cookies. 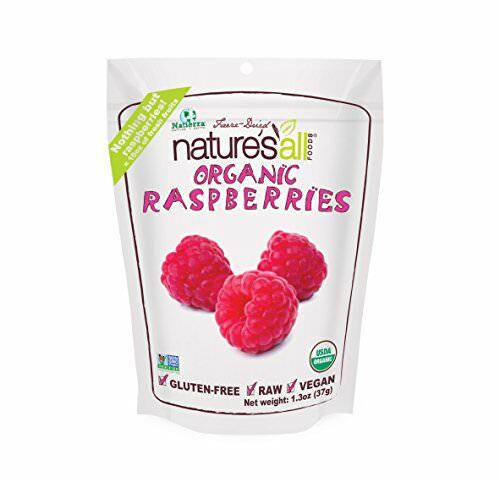 Instead of chocolate chips, they’re packed with gooey chocolate truffles, toasted nuts, and sweet-tart freeze-dried raspberries. 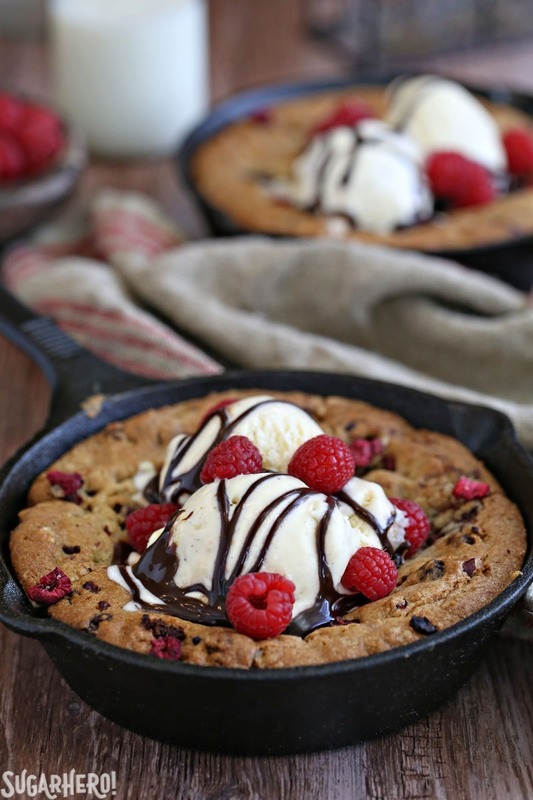 Serve them in a skillet with a scoop of ice cream on top for maximum indulgence! I’ve provided a recipe for homemade chocolate truffles to go in these cookies, but you can also use store-bought chocolate truffles, or even substitute large chocolate chunks if you prefer. Whisk together the flour, salt, baking soda, and baking powder in a medium bowl, and set aside. Combine the butter and both sugars in the bowl of a large stand mixer fitted with a paddle attachment. Cream the butter and sugars on medium speed for 2-3 minutes, until light and fluffy. Add the eggs one at a time, beating well after each addition. Add the yolk and vanilla extract, and mix them in as well. Turn the mixer to low speed, and add the flour mixture. Stop mixing when just a few flour streaks remain, and finish mixing the dough by hand with a spatula. Add the chopped pecans, freeze-dried raspberries, and chilled chocolate truffles, and stir them in until well-distributed. Divide the dough between the three pans and gently press it into an even layer. Bake at 350 F for 25-30 minutes, until a toothpick inserted into the center comes out with crumbs but is no longer gooey. The cookie will continue to bake once out of the oven, so take the skillets out a few minutes before you think the cookies are done. If the tops seem to be getting too dark before the centers are done, cover loosely with foil. You can let the cookies cool completely and serve in wedges, or serve directly from the skillet while still warm. Ice cream and fudge sauce are technically optional, but it should be a crime to eat a warm cookie without melting ice cream on top! Place the chopped chocolate in a medium bowl. Pour the heavy cream into a small saucepan and place the pan over medium heat. Bring the cream to a simmer, and once small bubbles appear all along the sides of the pan, pour it over the chopped chocolate in the bowl. Press a layer of cling wrap directly on top of the ganache and let it sit until it reaches room temperature. Once at room temperature, refrigerate the ganache until it is firm enough to scoop, about 1 hour. Cover a baking sheet with waxed paper or parchment paper. Use a candy scoop or spoon to form the ganache into small balls less than 1 inch. (If they’re too large, they’re hard to mix into the dough.) Dust your hands with a light layer of cocoa powder and roll the balls between your palms to get them round. Refrigerate the truffles until completely firm before using them. You can make this recipe in a large 10-inch skillet. Use all of the dough in one skillet, and bake for 40-45 minutes, covering the top with foil if it starts to brown too much. 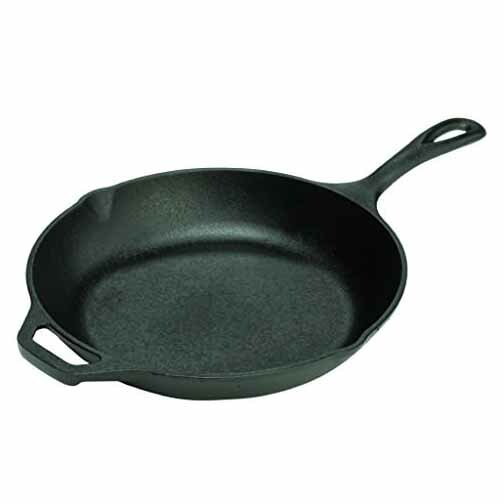 For miniature skillets, use six 4” skillets and bake for 15-18 minutes. For cookies, form into large 1 ½-inch balls and bake for 10-12 minutes, until the raw shine in the middle is gone and they start to take color along the edges. Hoooooly drool over here. This looks SO darn good, and is so pretty, too! Perfect for little Valentine’s Day treats! Hmmm !! Looks so good :0!! Just discovered your blog, very very nice ;D! Oh gosh this looks good and I love the idea of chocolate truffles instead of chips, part of the whole scaling the thing up! Brilliant! I love the “we are adults and we do what we wanna” approach 🙂 This is definitely a great Valentine’s Day treat! So rich and yummy! I am totally drooling over these pictures. I need to break out a pan and get this started now!! Can’t wait to try this recipe. The name alone makes me want this! And then the luscious pictures. Wow, I’ll take 2. Ok, maybe my eyes are bigger than my stomach, but it looks great! Oh wow! 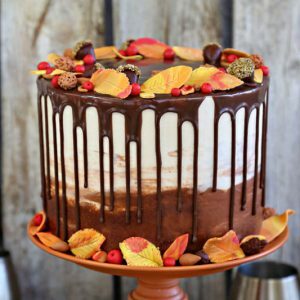 This looks so decadent! I want some!